About things which are sharp and pointy. 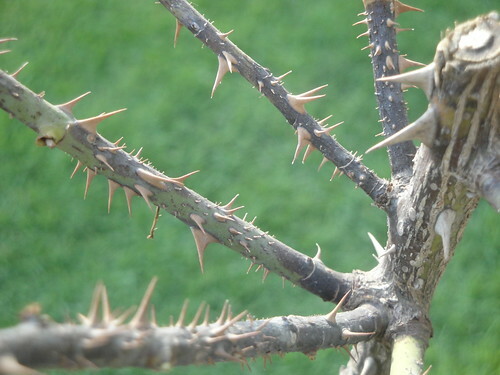 Like these rose thorns. Many may not look at them with the same amount of admiration they give to those gorgeous roses these thorns guide. Which is unfair in my opinion. Give them a close look and you will see how much beautiful they are indeed. They have a sharp point indeed, powerful enough to pierce through skin. But once in a while, it is good to look at things which aren’t as beautiful as their counterparts. May be we find that unique thing in them, which makes them special in their own way. This is my entry for K’LEE AND DALE’S COSMIC PHOTO CHALLENGE: THE SHARPEST IMAGE! Wow. Slightly dangerous, but wholly beautiful. Great job, my friend!